Western USA has over 100 geothermal areas, most famous being Yellowstone National Park in Wyoming, but also many much smaller locations, principally in California, Nevada, Utah and New Mexico. One of only four with active geysers in addition to the more common phenomena of fumaroles, mudpots and hot springs is Long Valley in east California, between Mono Lake and the head of Owens Valley; the main features are found beside Hot Creek, a small drainage flowing for a few miles across flat grassland alongside highway 395 east of the town of Mammoth Lakes. 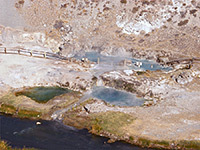 The US Forest Service-administered Hot Creek Geological Area along the stream contains over a dozen steam vents and bubbling blue pools, some of which occasionally erupt to form a geyser. Several other hot springs are found on farmland near the creek, all associated with the same underground system - like Yellowstone, this region was once part of a large volcano which erupted with massive force 760,000 years ago and released huge volumes of hot ash. 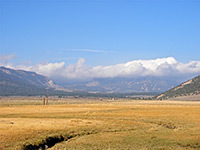 The resulting Long Valley Caldera is a 20 by 10 mile depression above a subterranean reservoir of molten rock, that continues to cause instability in the form of frequent earthquakes and occasional eruptions (most recent from 1720 to 1850). Other visible evidence of the region's volcanic history include a number of craters near Mono Lake in the north, and extensive lava fields to the south. Hot Creek Geological Area is reached by driving along Owens River Road, which forks off US 395 next to Mammoth Lake Airport. There is no access charge. The road is paved at first then gravel, and after 3.3 miles passes a parking area with rest rooms and picnic tables, from where a short path leads down to the edge of Hot Creek, here flowing through a shallow rhyolite canyon 100 feet deep. There is one thermal area on the far side of the creek and another just downstream, though both can only be viewed from a distance, as new access restrictions were introduced in summer 2006 following renewed geological activity. 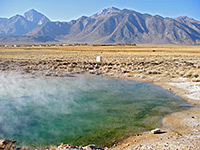 Several new vents appeared, water in some of the existing pools became hotter, arsenic levels grew, and the springs started to erupt unpredictably (though still infrequently), accompanying a general uplift of the center of the Long Valley Caldera, and an increased occurrence of minor earthquakes. The springs are now fenced off, swimming in the pools or creek is no longer allowed, and many notices warn of the danger of leaving the footpath - constraints likely to continue indefinitely. Besides those viewing the hot springs, the creek is also popular with anglers, and has unrestricted access just upstream, including several other roadside entry points. Tui chub, rainbow trout and brook trout are the main species that may be caught. 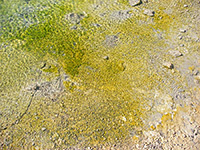 Of the half dozen or so pools nearby, the best is a large, bubbling, sulphurous spring at the foot of low hills separating Hot Creek Valley from neighboring Little Antelope Valley - hills that are right at the center of the recent caldera upsurge. The pool is not signposted though visible from several miles away, like others in the vicinity, by a cloud of white steam rising above. It can be viewed close up by walking a mile north across fields (and two streams), parking on the site of the former Mammoth School, at the start of a side road leading to the Hot Creek Fish Hatchery. This hot spring is 50 feet across and quite deep, containing a few underwater vents, and is also an occasional geyser. The hillside above offers sweeping views west and south across the valley towards the Sierra Nevada mountains. The nearest towns with hotels are Mammoth Lakes (8 miles west) and Bishop (37 miles south).